The first rule of 2018 is to greet any accusation of foul play with an assertion of exactly the opposite. Verizon has certainly gotten the memo. In August, the company was criticized for throttling the “unlimited” data plan of firefighters battling record-setting blazes in California and now it has a slick new ad campaign about all the ways it, actually, helps first responders. This summer, it took two months for firefighters to contain the largest wildfire in California’s history. The disaster claimed lives, homes, and property as it burned through hundreds of thousands of acres of land. In late August, Santa Clara County Fire Chief Anthony Bowden revealed that Verizon had throttled a SIM card that connected one of its mobile command vehicles. Bowden made his claim in an addendum to a multi-state legal brief calling for Congress to overturn the FCC’s end to net neutrality protections. He said that Verizon slowed data speeds on the account to 1/200th of their standard rate under the “unlimited data” plan. To get things working properly again, the telecom giant demanded the department upgrade its plan at twice the cost because it had exceeded its data limit. Because the world was literally on fire, the department gave in to the demand. For its part, Verizon told Ars Technica this was a “customer service error” rather than a net neutrality issue. 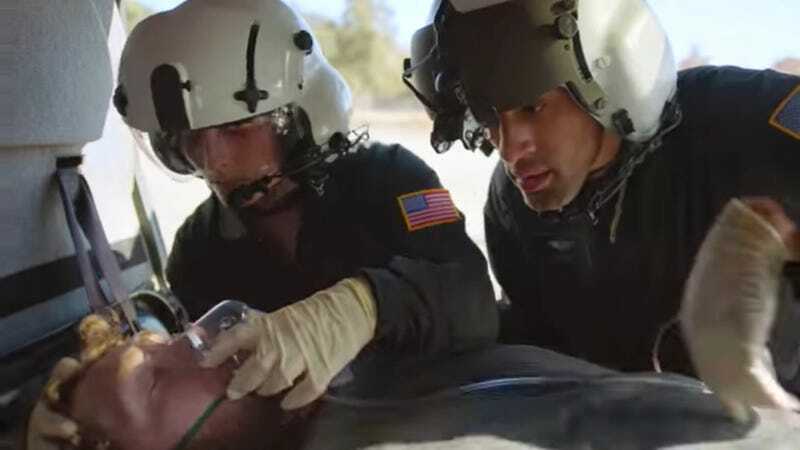 On Friday, Verizon released a 60-second ad called “Enabling Heroes” in which it paints its role as vital in the lives of first responders. The commercial’s voiceover mentions cell towers on wheels and flying drones that maintain communications. “In times of crisis, their calls go through and they can get their job done,” Verizon Chief Network Officer Nicki Palmer confidently tells the viewer. According to Ars Technica, users flooded the video’s comment section with vitriol and downvotes, prompting Verizon to disable comments. You can still see the comments that Redditors left over the weekend. In an accompanying blog post introducing the ad, Verizon wrote, “Our innovations and technology allow first responders to do their jobs. What we do saves lives.” Of course, it’s egregious that Verizon would do a full-court press to spread the word that first responders would be lost without Verizon after it just fucked up the work of real-life firefighters in California. When a company advertises unlimited data plans and doesn’t actually offer unlimited data, it causes you to question the truth of everything it says. For instance, at one point during the ad, text appears on screen claiming: “More first responders in America rely on Verizon than any other network.” In small, dark grey print at the bottom of the screen, more text says “America’s leading wireless voice provider.” Is that little extra text implying that the first claim is just an assumption based on the second claim? Also, why doesn’t the ad identify the departments of the firefighters who give testimonials in the ad? It does give their names, and a quick search shows that they are genuine firefighters. Verizon didn’t immediately respond to our questions about the ad, and it’s a relatively inconsequential thing to note. But still, it’s a reminder that this ad really just consists of two firefighters saying that Verizon is good. In August, Motherboard reported that over 1,000 firefighters, EMTs, paramedics, and other first responders had signed an open letter supporting net neutrality as a response to Verizon’s greed. Most important of all, what’s going on with that new unlimited plan for first responders that Verizon promised in August? The company said that eligible applicants would get the plan at no additional cost, it would have “no caps on mobile solutions,” and it would automatically include “priority access.” Verizon did not immediately respond to our request for updates on that plan’s rollout. Verizon should focus on delivering on its promises rather than pretending it offers any innovations other than redefining the word unlimited.